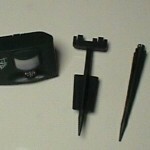 PRODUCT DESCRIPTION: Powered by one 9 Volt Battery, this unit is activated by a Motion Detector so it's not always on. Once activated, it will sound for 3 seconds then shut off. Ultra Sound Device which emits sounds that are specifically designed to fall in the range of sound which cats find irritating. Most units like this have variable sounds which alter automatically or can be adjusted manually so that different target animals can be repelled. Not so with this unit. 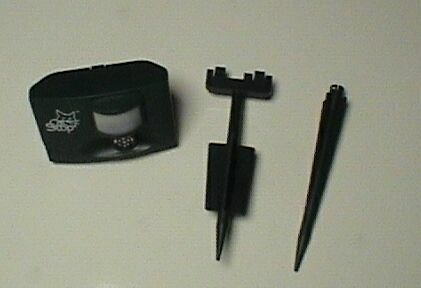 Instead of a variable range, this unit has one fixed sound that has been identified as the most effective to use when targeting cats. Alternative power supply input possible. It has a built in receiver for a 9 Volt power supply so it can be powered from a wall outlet. The AC converter is not included. WHERE TO USE IT: Inside or outside. Great for garden areas, flower beds, specific rooms in the house, bird feeder areas (won't hurt or bother birds or other animals) and garages to keep cats off cars. RATE OF APPLICATION: One unit for every 330 sq/feet you want to protect from cats and/or cat activity. Expected battery life should be around 6 months. Can I leave this item inside the car? I'm assuming you meant to ask if you can leave the item "turned on and operating inside a car"? If that's what you meant to ask then yes, you can. Typically customers will set them up just outside a car to keep cats from jumping on it, nesting in the motor housing, climbing on the roof and scratching the finish, etc. So if your car getting cat activity on its "outside" or exterior, setting up at least one device about 15 feet behind the car or in front of it pointing directly at the vehicle should stop the activity. Basically the goal is to "blanket" the car with the sound waves. Now if there is some reason you are "okay" with them hanging around the outside area of the car and specially only want to keep them from entering the passenger compartment, then deploying the unit inside would accomplish that goal for sure.